主機名稱 訪客用以造訪您網站的主機名稱，通常是您的網站網址。 Hostname The hostnames visitors used to reach your site. Typically, your site’s URL. 先前造訪的路徑 previousPagePath Previous Page Path The page the user was on just prior to viewing the current page. 完整推薦連結來源網址 廣告獲得流量的網址。 Full Referrer The URLs that referred traffic. 使用者定義的值 當您為您的網站定義自訂訪客區隔時所提供的值。 User Defineed Value The value provided when you define custom visitor segments for your website. 到達畫面 訪客進入應用程式的畫面。 Landing Screen A screen through which visitors enter an app. 到達網頁 訪客一進入您網站所看到的網頁。 Landing Page The pages through which visitors entered your site. 後續造訪的路徑 點擊廣告後實際連到的網頁。 Next Page path Destination page. 修正關鍵字 用來修正內部搜尋的搜尋字詞。 Refined keyword The search terms used to refine internal searches. 站內搜尋狀態 將造訪分為包含使用與未使用內部網站搜尋。 Site Search Status Distinguishes visits that included an internal site search and those that did not. 站內搜尋類別 訪客搜尋您網站所使用的搜尋類別。 Site Search Category The categories searched by visitors searching your site. 起始網頁 訪客用來搜尋您網站的網頁。 Start Page The pages from which visitors searched your site. 畫面名稱 某個應用程式畫面的名稱。 Screen Tern The name of a specific app screen. 搜尋字詞 訪客用來搜尋您網站的搜尋字詞。 Search Tern The search terms used by visitors to search your site. 實際連結網頁 點擊廣告後實際連到的網頁。 Destination Page Destination page. 應用程式名稱 您應用程式的正式名稱，也就是開發人員在您帳戶中指定的名稱 (例如 MyApp：特別版)。 App Name The name or package name for a specific app marketplace, like GooglePlay or another AppStore. 應用程式安裝工具編號 Google Play 或其他 AppStore 等應用程式市集的名稱或套件名稱。 App Installer ID The individual app ID designated by a specific app marketplace, like GooglePlay or another AppStore. 應用程式版本 應用程式的版本號碼 (例如 1.5)。 App Verrsion The version number of an app (e.g., 1.5). 應用程式編號 由 Google Play 或其他 AppStore 等應用程式市集所指定的個別應用程式編號。 App ID The individual app ID designated by a specific app marketplace, like GooglePlay or another AppStore. 瀏覽頁數 每個工作階段的訪客瀏覽量。 Page Depth The number of pages viewed by visitors in a session. 瀏覽畫面數 在一個工作階段中查看的畫面數。 Screen Dapth The number of screens viewed in a session. 離開畫面 訪客離開應用程式的畫面。 Exit Screen The pages visitors viewed last on your site. 離開網頁 訪客離開您的網站前最後看到的網頁。 Exit Page The pages visitors viewed last on your site. 分享網址 社交內容網址：社交活動中所提及的網址/內容。 Social Entity The page (i.e. URL) or entity that was shared. 社交來源 發生活動的社交來源或網路 (例如 Facebook、Twitter、Google)。 Social Source The social source or network on which the activity occurred (e.g. Facebook, Twitter, Google). 社交來源和操作 社交來源/網路以及發生的動作 (例如 Facebook 的「讚」)。 Social Source and Action The social source/network and action that occurred (e.g. Facebook-Like). 社交網路 來源社交網路：帶來活動的社交網路。 Social Network Originating Social Network — The social network where the activity originated. 社交類型 「社交互動」或「非社交互動」。 Social Type Either “Socially Engaged” or “Not Socially Engaged”. 上次造訪後所經過的天數 訪客造訪網站後經過的天數。 Days Since Last Visit The number of days elapsed since visitors last visited the site. 共鳴度類別(觸及率) 這些區隔中的使用者很有可能想瞭解指定類別的內容。 Affinity Category(reach) Users in these segments are more likely to be interested in learning about the specified category. 年齡 使用者的年齡層。 Age Users’ age brackets. 行動裝置品牌塑造 製造商或品牌名稱 (例如：Samsung、HTC、Verizon 和 T-Mobile)。 Mobile Device Branding Manufacturer or branded name (examples: Samsung, HTC, Verizon, T-Mobile). 行動裝置資訊 用來識別裝置的品牌、型號和行銷名稱。 Mobile Device info The branding, model, and marketing name used to identify the device. 作業系統 網站訪客使用的作業系統，包括行動作業系統 (例如 Android)。 Operating System The operating systems used by visitors to your website. Includes mobile operating systems such as Android. 作業系統版本 網站訪客使用的作業系統版本。 Operating System Version The operating system versions used by visitors to your website. 其他類別 這些區隔中的使用者更有可能想瞭解指定類別，也更有可能準備要購物。 Other Category Users in these segments are more likely to be interested in learning about the specified category, and more likely to be ready to purchase. 服務供應商 您網站訪客所使用的網際網路服務供應商 (ISP) 名稱。 Service Provider The names of the Internet service providers (ISPs) used by visitors to your site. 城市 訪客的城市 (依 IP 位址顯示)。 City The cities from which visits originated, based on IP address. 洲別 訪客所在的洲別 (依 IP 位址顯示)。 Continent The continents from which visits originated, based on IP address. 洲別次地區 訪客所在的洲別次地區 (依 IP 位址顯示)。 Sub Continent Region The sub-continents from which visits originated, based on IP address. 區域 訪客的地理區域 (依 IP 位址顯示)。 User’s gender. The geographic regions from which visits originated, based on IP address. 國家/地區/領域 訪客的國家/地區 (依 IP 位址顯示)。 Country / Territory The countries from which visits originated, based on IP address. 訪客區塊 隨機指定的訪客標記可讓您進行 A/B 測試並分割再行銷名單，範圍從 1-100。 Vistitor Bucket Randomly assigned visitor tag to allow A/B testing and splitting of remarketing lists. Ranges from 1-100. 訪客類型 新訪客 (首次造訪) 及回訪者。 Vistor Type New Visitor (first-time visit) and Returning Visitor. 若您使用這個維度來建立訪客區隔 (例如用於再行銷名單)，您就能在全部的工作階段中，找出符合您所套用條件的所有訪客 (例如造訪超過 5 次的所有訪客)。 Count of Visits The total count of visits to your site. If you’re using this dimension to create a visitor segment (e.g., for a remarketing list), then you’re identifying all visitors over all sessions who match the criteria you apply; for example, all visitors who have more than 5 visits. The amount of time in seconds that users spend on the site, from a per-visit perspective. The per-visitor sum of Visit Duration for the last seven days. 裝置類別 裝置類型：桌機、平板電腦或行動裝置。 Device Category The type of device: Desktop, Tablet, or Mobile. 語言 您網站訪客的語言偏好設定。 Language The language preference settings of visitors to your site. 潛在買家區隔 位於這些區隔中的使用者較有可能會購買指定類別中的產品或服務。 In-market Segment Users in these segments are more likely to be ready to purchase products or services in the specified category. 螢幕色彩 訪客的螢幕色彩深度。 Screen Colors The screen color depths of visitors’ monitors. 螢幕解析度 訪客的螢幕解析度。 Screen Resolution The screen resolutions of visitors’ monitors. 瀏覽器 網站訪客使用的瀏覽器。 Browser The browsers used by visitors to your website. 瀏覽器版本 網站訪客使用的瀏覽器版本。 Browser Vision The browser versions used by visitors to your website. Flash 版本 訪客使用的瀏覽器所支援的 Flash 版本 (包含次要版本)。 Flash Version The versions of Flash supported by visitors’ browsers, including minor versions. Java 支援 區分訪客的瀏覽器是否已啟用 Java。 Java Suppoty Differentiates visits from browsers with and without (Yes or No) Java enabled. Network Domain The fully qualified domain names of your visitors’ Internet service providers (ISPs). 來源 廣告獲得流量的來源，包含透過 utm_source 辨識的來源。 Source The sources which referred traffic. Includes sources identified via utm_source. 流量類型 網站的流量類型：搜尋、推薦連結、直接及其他。 Traffic Type The types of traffic to your site: search, referral, direct, and other. 推薦連結流量 廣告獲得流量的 URI。 Referral Path The URIs that referred traffic. 媒介 廣告獲得流量的媒介。包含透過 utm_medium 辨識的媒介。 Medium The mediums which referred traffic. Includes mediums identified via utm_medium. 交易 電子商務交易的交易編號。 Transaction The transaction IDs of the ecommerce transactions. 交易前造訪次數 從推薦連結到購買的造訪次數。 Visits to Transaction The number of visits from referral to purchase. 完成前所需天數 從廣告活動推薦到使用者購買兩者相隔天數。 Days to Transaction The number of days between users’ purchases and the campaign referral. 貨幣代碼 交易貨幣代碼 (適用於總費用、稅金、運費和處理費以及商品費用)。 Currency Code Transaction currency code (applicable to total cost, tax, shipping and handling, and item cost. 聯盟 電子商務交易指定的聯盟。 Affiation The affiliations assigned to ecommerce transactions. 刊登位置網址 您的廣告在內容廣告聯播網中刊登的網址。 Placement URL The URLs where your ads on the content network were placed. 刊登位置網域 您的廣告在內容廣告聯播網中刊登的網域。 Placement Domain The domains where your ads on the content network were placed. 刊登位置類型 內容比對刊登位置或自選刊登位置。 Placement Type Automatic placement or managed placement. 指定類型 AdWords 廣告指定目標的方式 (例如指定關鍵字、指定刊登位置和指定產業別等等)。 Targeting Type How your AdWords ads were targeted (keyword, placement, and vertical targeting, etc.). 查詢比對類型 您的關鍵字會以何種方式實際比對搜尋查詢，例如「廣泛比對」、「詞組比對」或「完全比對」。多媒體廣告聯播網上的廣告會標示為「多媒體廣告聯播網廣告」。「查詢比對類型」可與您在 AdWords 中選取的關鍵字比對類型不同。 Query Match Type How your keyword was actually matched to the search query, i.e., Broad match, Phrase match, or Exact match. Ads on the content network are identified as Content network ads. The Query Match Type can differ from the keyword match type you selected in AdWords. 相符的搜尋查詢 觸發您 AdWords 廣告曝光的實際搜尋查詢。 Matched Search Query The actual search queries that triggered impressions of your AdWords ads. 實際連結網址 從您的 AdWords 廣告獲得轉介流量的網址。 Destination URL The URLs to which your AdWords ads referred traffic. 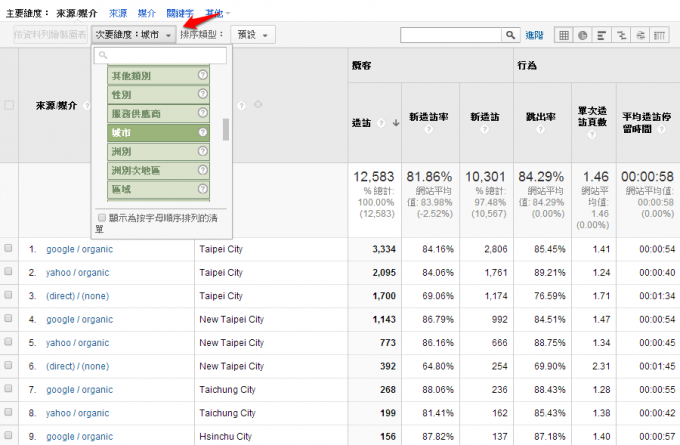 廣告內容 每則 AdWords 廣告的第一行，以及已標記廣告活動中所用的 utm_content 標記。 Ad Content The first line of each AdWords ad and the utm_content tags that were used in tagged campaigns. 廣告放送聯播網 顯示過您廣告的位置 (google.com、搜尋聯播網夥伴或多媒體廣告聯播網)。 Ad Distribution Network The location where your ad was shown (google.com, search partners, content network). 廣告版位 廣告在代管網頁上的位置 (頂端、右側或未設定)。 Ad Slot The location of the advertisement on the hosting page (Top, RHS, or not set). 廣告版位排名 AdWords 廣告在廣告版位中顯示時的排名 (1-8)。 Ad Slot Position The ad slot positions in which your AdWords ads appeared (1-8). 廣告活動 您 AdWords 廣告活動的名稱，以及在帶有標記的廣告活動中所用的 utm_campaign 標記。 Campaign The names of your AdWords campaigns and the utm_campaign tags that were used in tagged campaigns. 廣告格式 AdWords 廣告的格式 (例如文字、圖像、Flash、影片等等)。 Ad Format Your AdWords ad formats (Text, Image, Flash, Video, etc.). 廣告顯示網址 刊登您 AdWords 廣告的網址。 Display URL The URLs your AdWords ads displayed. 關鍵字 使用者用以尋找您網站的所有付費及非付費關鍵字。 Keyword All keywords, both paid and unpaid, used by users to reach your site. 關鍵字比對類型 您在 AdWords 中選取的關鍵字比對類型 (例如廣泛、詞組或完全比對)。 Keyword Match Type How your AdWords ads were targeted (keyword, placement, and vertical targeting, etc.). AdWords 客戶編號 AdWords 客戶編號。 Adwords Customer ID The AdWords customer ID. AdWords 廣告活動編號 adwordsCampaignID Adwords Campaign ID The unique identification number of your AdWords campaign. AdWords 廣告素材編號 adwordsCreativeID Adwords Creative ID The unique identification number of your AdWords creative (ad text). AdWords 廣告群組編號 adwordsAdGroupID Adwords Ad Group ID The unique identification number of your AdWords ad group. AdWords 標準編號 adwordsCriteriaID Adwords Criteria ID The unique identification number of your AdWords criterion. TrueView 影片廣告 “True” indicates that the ad is an AdWords for video TrueView ad. “False” indicates that it is a different type of ad format. TrueView Video Ad “True” indicates that the ad is an AdWords for video TrueView ad. “False” indicates that it is a different type of ad format.